Joseph Sciabarra, General Manager, has approximately fifty years experience in all aspects of the fish business and industry. His wealth of knowledge has been passed down to his son, Michael Sciabarra, Sales Manager, at Mt. 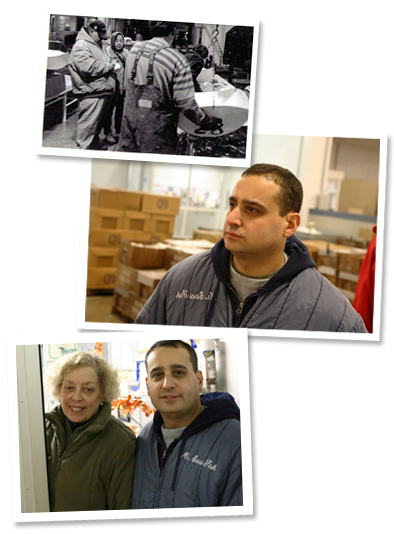 Sinai Fish, Inc. Joseph is a union trustee f or Local 359 and also serves as Secretary of the Board of Directors at the New Fulton Fish Market at Hunts Point. Michael Sciabarra is a graduate of Kutztown University, with a Bachelor of Science degree; he is certified in Seafood Hazard Analysis & Critical Control Point Theory and Practical Application. Denise Sciabarra-Giannone, Accounts Payable Manager, is a graduate of Hofstra University with a Bachelor of Business Administration degree and a Masters degreee in Liberal Arts. Denise's responsibilities include the management of the Accounts Payable Department. Janice Sciabarra, Accounts Receivable Manager, is a graduate of C.W. Post College with a Bachelors Degree in Accounting. Janice's responsibilities include the management of the Accounts Receivable Department. Judy Sciabarra, Office Manager, with ten years of human resource management experience rounds out the administrative staff at Mt. Sinai Fish, Inc. Her duties include the administrative management of the office.